W.Bro. P. Vijay Kumar was initiated into the mysteries and privileges of Freemasonry in Lodge Trivandrum No. 168, on the 5th of July 1998. He was passed and raised on 18th October 1998 and 15th May 1999 respectively. W.Bro. Vijay Kumar has held various offices in the Lodge and was Installed as the 43rd Master of Lodge Trivandrum on the 19th of January 2007. He has been the webmaster since the inception of the Lodge website in 2002. A member of Chapter and Mark Lodges in Thirivananthapuram, he also often participates in Lodge meetings in USA during his tours there. W. Bro. Vijay had his early education in Loyola School, Trivandrum - where he was the School Leader, and later graduated in Mechanical Engineering from the College of Engineering, Trivandrum. He was a merit scholar at the School of Management Studies where he completed his MBA program, during which period he also excelled in sports and captained his University team in Basket ball. The winner of several prizes in Elocution and Declamation at the School, College and University levels, W. Bro. Vijay Kumar was the Chairman of Talentime - a popular cultural festival attracting students from all across the country. In 1999 he visited Georgia for a month as a member of the group study exchange program, where he was symbolically bestowed honorary citizenship to the state of Georgia, by its Governor. As a member of Round Table India (RTI), W.Bro. Vijay has served on its National Executive Board for two consecutive years, handling the portfolio of HRD and Leadership Development. As a national trainer of RTI, he has conducted several programs in leadership development, communication, team building as also, orientation programs to members of the National and Area Boards all across the country and abroad. After completing his MBA education, W. Bro. Vijay Kumar worked with Castrol Lubricants for a couple of years before being bitten by the entrepreneurial bug. After initially engaging in a few franchise operations, he went on to be the co-founder of InApp Information Technologies. InApp is an IT company headquartered in Palo Alto, California having its software development center located in Technopark, Trivandrum. W. Bro. 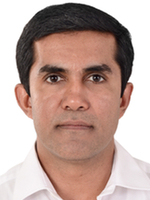 Vijay Kumar currently serves as the Chief Operating Officer at InApp. W.Bro. Vijay Kumar is married to Smt. Supriya and has two daughters Aparna and Ambika.